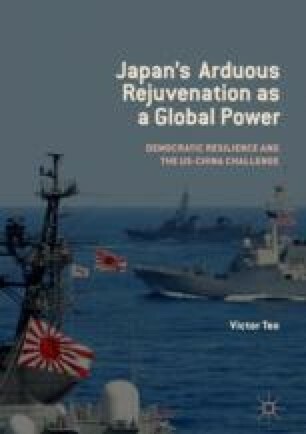 The chapter provides a holistic analysis and assessment of Japan’s normalization and rejuvenation efforts by re-examining the three important pillars: constitutional revisionism, the renewed US-Japan alliance, and the erosion of pacifism and deployment of Japan’s military overseas. The chapter then assesses Japan’s rejuvenation from the vantage points of the US and China, as well as from the perspective of those within Japan who are opposed to the neo-conservatives in Japan. The chapter then concludes the book by offering some possible policy alternatives for scholars and policymakers working on Japanese foreign policy to consider in their work. Japan’s rejuvenation as a “normal” nation has been an arduous and difficult journey to say the very least. Contrary to conventional wisdom, Japan’s normalization and rejuvenation is not just the purview of the LDP conservatives, but remains at the heart of the nation’s debate on constitutional revisionism, on the future of Japan’s alliance with the US and the status of Japan’s commitment to global intervention through the deployment of the JSDF. There is a consensus across the broad political spectrum in Japan concerning the importance of the US to Japan’s global strategy, security posture and foreign affairs, just as there is broad-based support for Japan’s shouldering of more responsibilities globally, particularly in terms of humanitarian and disaster relief. This is significantly positive as even though Japan underwent a two-decade economic stagnation, its impulses to act for UN mandated aspirations and goals remained strong. In the post-Cold War period, Japan evolved from a passive bystander to a nation that is more able and capable than ever before in its recent history to meet with key foreign and security policy challenges. This journey has been exceedingly difficult, primarily because no one, even at the policy elite levels, has known exactly where Japan was heading strategically, particularly in the early 1990s. The Japanese people as a society have always had the tradition of consultation and consensual decision-making. Together with a vicarious press, increasingly assertive politicians and Diet members who tend to get rowdy when things don’t go their way,1 the debate on the way forward has of late become very difficult. The rejuvenation of Japan today rests on three important pillars—the management of the US-Japan alliance, the erosion of pacifism and changing mindsets in Japan on the deployment of the JSDF globally lastly, the revision of the postwar constitution. All these items have always been extremely important to the conservative agenda in the immediate postwar era, even though they have never had the opportunity to be brought to the forefront of Japan’s political agenda. Across the decades, postwar Japanese prime ministers have slowly but surely worked out how to manage Japan’s security and interests by combining traditional influences, realpolitik considerations and lessons drawn from past experiences. Without question, the most important element by far for Cold War prime ministers was the management of the US-Japan security alliance. During the early postwar decades in the 1950s and 1960s, Japan as a nation had always debated upon the extent to which it could and should cooperate with the US in military and strategic terms. Right up to the 1960s, after the revised US-Japan security treaty was put in place, the rationale and logic of the US-Japan alliance was neither always clear nor uncontested. Initially, cooperation with the US came as a natural result of the Occupation—but for many Japanese, particularly those with ties to the pre-war government, this turn of affairs was far from natural. Yoshida Shigeru, Hatoyama Ichiro, Ishibashi Tanzan, Kishi Nobusuke, Ikeda Hayato, Sato Eisaku, Tanaka Kakuei, Fukuda Takeo, Miki Takeo, Ohira Masayoshi, Suzuki Zenko, Nakasone Yashuhiro, Takeshita Noboru, Miyazawa Kiichi, Kaifu Toshiki, Hosakawa Morihiro, Murayama Tomiichi, Ryutaro Hashimoto, Keizo Obuchi, Mori Yoshiro and others all had to contend with evolving demands and tensions in Japan’s relations with the US, even though on the surface things appeared to be rosy. For many of the other prime ministers born during or after the war, this might have mattered less. Koizumi Junichiro, Abe Shinzo, Taro Aso, Yukio Hatoyama, Kan Naoto, Noda Yoshihiko are of this era. The retrospective evaluation of the foreign policy records of these are varied, but one dominant theme that stands out is the vexing difficulty most prime ministers faced in managing the demands of the US and reconciling public mood and the capabilities of Japan with these demands at any particular point. Many of those who grew up in the 1950s and 1960s understood that what the US wanted did not always coincide with what Japan desired. There was widespread resistance to the US during the 1960s, because many believed that the Cold War goals were antithetical to the pacifist and democratic spirit that the Japanese nation embodied. Contrary to the popular idea that Japan had slavishly followed the strategic lead of the US, an important but subtle question for Tokyo has always been how to incorporate resistance through cooperation with the US, and in doing so maintain a more equidistant relationship with the US. Generations of prime ministers worked hand in hand to ensure that the relationship was never an easy one-way relationship. Japan’s alliance with the US evolved from one where Japan had relatively little say or choice in the immediate period after the Occupation, to one that saw a confident Japan emerge as a challenger to the US, to what looks like a true partnership today. Thus, the US-Japan security alliance was managed as a Cold War institution initially and viewed as a suspect and anti-democratic institution by the Japanese during the initial postwar years. As we have already seen, the idea of this US-Japan relationship being an “alliance” was only first mooted in the early 1980s. What everyone takes for granted today as the “bedrock of peace and stability” was therefore only conceived as an intellectual construct about four decades ago. Since then, Japan has come to increasingly rely on the US for strategic direction, even though its national strength grows. By the end of the Cold War, the US had become a truly global power that had significant sway over regional affairs across the globe, from Latin America to Southeast Asia. Often integrated deeply into regional affairs, the US has more times than not found itself at odds with one (or more) of the regional hegemons. In the Middle East, the US is constantly challenged by Iran and the radical groups, in Europe by Russia and in East Asia, China. Insofar as Tokyo is concerned, the US-Japan alliance has served Japan in a largely positive way in the Asia-Pacific region. Outside the Asia-Pacific region, Japan’s close association with the US brought about knock-on difficulties. As exemplified by the discussion on the Middle East, the difficulties are brought about in two dimensions. First, even though Tokyo has had varying differences with Washington in their approaches over certain issues (for example on the Iran nuclear challenge and their handling of the Arab-Israeli conflict), Japan has chosen to harmonize its policies with the US, as alliance unity is paramount and prioritized. Second, close political association with the US often imposes an opportunity cost almost immediately. In its bid to cultivate strong relations with important Middle East countries such as Saudi Arabia, Tokyo found that the latter was more interested in Beijing than in Tokyo for the simple reason that China can act as a counterweight and leverage to the US in a way that Japan cannot. For that reason, Japan often finds itself frustrated because it is unable to pursue its interests in an adulterated manner. Japan’s own preference to play a supporting role and privileging US policy goals is a major stumbling block to Japan’s rejuvenation. The question going forward for Japan is therefore whether it would be able to move beyond this political culture and the attendant constraints it has imposed upon itself to adopt a more independent foreign policy in instances when it serves its interests to do so. With the inception of the Trump administration, the nature of US domestic politics changed drastically. Trump’s unconventional political strategy and the vicious overdrive by his political enemies to topple his administration have impacted upon US foreign policy. To that end, it has had several fundamental spill-over effects on Japan’s foreign policy. First, Trump’s America First policy has provided a change in the way the US worldview and priorities are framed, and this has severely impacted on the mainstream politics and agenda of both parties, particularly in the way costs of alliance and foreign intervention are discussed. This goes far beyond the bipartisan political bickering that observers of US politics are used to. At the heart of this debate is whether the US should continue to bear the costs for its global presence, as this is now framed as a “burden” for US taxpayers, and undermines the support built up over the decades domestically for global US presence. When it comes to cost calculations, the US has neither enemies nor allies, and “issues” to do with burden sharing are taken care of—the US will not be “ripped off” by its allies. Needless to say, such rhetoric affects the leadership credentials of the US, thereby alienating and increasing tensions with its traditional allies. From Germany to France to Australia, every incumbent leader appears to have taken political potshots at President Trump and the values that the US now appears to stand for. Tokyo is concerned about the impact this has had for US leadership and the cohesiveness of the liberal democratic order that Japan’s security has come to rely on so much. Second, the Trump administration has undertaken policy adjustments that impacted directly on the US-Japan alliance, such as the unilateral withdrawal from TPP, pressuring Tokyo on trade concessions and undertaking negotiations with North Korea without prior consultation with Tokyo. This has both shocked and dismayed many within the Abe administration, but at the same time provided the impetus for Japan to reconsider its own policy adjustments. Third, at the risk of great political cost, Prime Minister Abe has built a close personal relationship with President Trump in service of the bilateral alliance. Through his deft personal diplomacy, Abe has quietly and stealthily taken the senior statesman role in steering the US-Japan alliance, despite the policy setbacks originating from Trump’s decisions. The inclusion of India and Australia as part of the Quadrilateral Security Dialogue, Japan’s constant urging of an improvement in India-US relations, and Tokyo’s active measures to support the Philippines and Vietnam in the South China Sea are some of Japan’s initiatives to help enhance its security in the region vis-à-vis China. Prime Minister Abe has become the person most instrumental in pushing for initiatives to shore up the alliance, as the Trump ascension has provided an unprecedented opportunity for Tokyo to try and strengthen its position in the alliance and steer it in the direction Tokyo desires. The second pillar of Japan’s rejuvenation—that of restoration of Japan’s military prowess and the restoration of the JSDF’s status—is probably one of the more successful elements of the neo-conservatives’ strategy so far. Even though this aspect has been critically stifled by the Japanese nation’s preference for pacifism in the immediate aftermath of the Second World War, the neo-conservatives have successfully changed the way the military is being conceived in Japan today. For much of the postwar period, pacifism acted as both the moral compass of the people and the ideological shield that the Japanese government used to fend off US demands for Japan to do more. In realpolitik language, Tokyo used pacifism to protect Japan from the possible dangers of alliance chain-ganging, of being dragged into an unwanted war that Japan had no wished to be involved in. The provisions of the treaty were such that there is no obligation for Japan to come to the aid of the US should it be attacked, but this did not prevent unwanted criticisms of free riding and evading rightful international obligations. A turning point came in the aftermath of the Gulf War, where a frustrated and bewildered Japan struggled to understand why, despite contributing more than USD 7 billion to the war effort, “boots on the ground” mattered more politically and symbolically to the international community. In the early post-Cold War period, Japan’s normalization took shape with increasing UN missions within Asia, as evidenced by Japan’s UN peacekeeping missions in Cambodia and East Timor, as well as the deployment of elements of the JSDF to assist in operations in Iraq, Afghanistan, the Indian Ocean, Somalia and Sudan. With generation change, strategic shifts in Japan’s external environment, and increased nationalistic sentiments within Japan, the neo-conservative’s normalization agenda and rejuvenation aspirations were propelled to the forefront. Even though Japanese elites and the Japanese people agree that Japan should support UN mandated operations and contribute to worthy global missions, the debate often centers on the extent and the manner by which Japan should do so, as Japan is constitutionally prohibited from waging war or maintaining “war potential.” Japan has certainly made adjustments to its defense posture vis-à-vis the US-Japan security alliance. These adjustments are incremental, and often take on mundane administrative measures or Dietary legislations—but nonetheless, they do help the government skirt constitutional constraints incrementally. This started in earnest after the Hashimoto–Clinton agreement in the mid-1990s, when a series of guidelines were put in place to help support Japan participating more actively (and legally) in US-Japan alliance operations. Since then, Japan and the US have worked closely to ensure that Japan continues to improve the JSDF operational capabilities through better legislation, joint training and closer coordination. The Japanese government began to interpret “threats to Japan” in a “situational” manner to protect Japan and its people, shifting the doctrine of strict self-defense to one that allowed Japan to exercise the right to collective defense. This is a much bigger step from the Japanese government’s official decision in February 1956 that deemed that it is constitutional to possess capability to attack enemies when there is no other measure to defend itself from external aggression (Tatsumi, 2018). This right to collective defense was deliberated in the Diet in 2015, and the security bills were pushed through by the Abe government. This would include situations such as a contingency involving North Korea and US forces off the Korean Peninsula to a China-Taiwan conflict involving US forces in the Taiwan Straits. Japan could also in theory engage in military action in the Gulf if its ships laden with petroleum were endangered. Through the security bills passed in 2015, the JSDF is now able to participate in collective defense and fight a foreign conflict as long as the government deems it appropriate. In 2017, Defense Minister Itsunori Onodera went further, saying that a North Korean ballistic missile attack on Guam would also constitute a survival-threatening situation, as this would degrade the capabilities of the US military that are important for Japan’s national security. Today, the Japanese military is one of the best armed and best equipped in the Asia-Pacific region, if not the world. Be that as it may, the neo-conservatives are now waging a public relations and political battle, as well as a court battle, to have their policy upheld (Aibara 2018). In January 2018, Prime Minister Abe stipulated that rather than following the traditional linear project used in previous National Defense Program Guidelines (NDPG), there would be an honest assessment of the challenges facing Japan and that 2018 would see the operationalization of his plans (Tatsumi, 2018). By December 2018, the Abe cabinet had finalized a new set of National Defense Policy Guidelines that endorsed the Japan defense ministry’s plans to retrofit two helicopter carriers to become aircraft carriers. Additionally, Japan also committed to purchasing around 100 F-35s fighters to replace aging F-15s, and additional 42 F-35b variant aircrafts to be used on the two Izumo-class carriers. Japan also began to cultivate abilities for cyber and space warfare. Naturally, critics of the Abe government and opponents of the neo-conservatives inside and outside of Japan were outraged by these developments. To have bureaucrats interpret whether something is “constitutional” or not is clearly problematic, as is the slippery slope logic presented by the Abe cabinet. If indeed the aircraft carriers are “escorts,” then clearly there is nothing stopping Japan from manufacturing more of these “escorts” in the future, should the need arise. Furthermore, it does not take many of these advance fighters to cause widespread destruction, given the advancement of military technology. There is a belief among scholars that the pacifism, moral compass and ideological restraint infused into Japan since the end of the Pacific War has all but eroded. The popularity of this view might be due to governments attempting to disseminate the view through its official narratives and the media, but it is also popularized by Japan watchers in the West, who are often keen to advocate for the containment of China, and lastly, but also ironically, by narratives coming out of China itself. Certainly the conversion of Izumo from helicopter carriers to aircraft carriers, or the purchase of 142 (estimated) F-35s and the institution of cyber defense and space warfare capabilities, does not make the “pacifism” look real anymore. The neo-conservatives’ rhetoric that Japan has to change with the times, live up to its alliance responsibilities, fulfill its obligations as a responsible global power and look after its own interests and security has certainly been operationalized. The third and most important pillar in the rejuvenation effort—that of constitutional revisionism—is arguably the most difficult pillar for the neo-Conservatives to achieve. In retrospect, as the prime minister with the greatest stock of political capital and strategic instincts, and what looks like a divine opportunity coming to power again in 2012 in the aftermath of DPJ’s mishandling of the Senkaku issue with China, Shinzo Abe struggles with uphill support for constitutional revisionism despite the LDP’s relentless attempt to chip away at the obstacles. During his first term (September 2006–September 2007), the prime minister made a political mistake of privileging this goal above all others, and this contributed to his early resignation as prime minister. Prime Minister Abe was reelected in 2012, becoming the first Prime Minister to return to office since Shigeru Yoshida in 1948. He was reelected in 2014, and then again in 2017. At the time of writing, the Prime Minister is the fourth longest serving Prime Minister in history. This resilient Prime Minister has miraculously just survived two political scandals and, at the time of writing, is now enjoying improved approval ratings. The August 2018 victory for Prime Minister Abe for the leadership of the LDP thus presents one of the best opportunities for the neo-conservatives to renew their push for, and to effect, such a change. Prime Minister Abe himself has indicated that this is to be achieved by 2020. The attempt to revise the constitution must be viewed as a 70-year old exercise, stemming from attempts by Japanese conservatives from the Yoshida era, even before the existing constitution was put in place. The roots of the complaints are common-place enough, even though they have been repeatedly articulated by various factions attempting to justify constitutional revisionism over the past few decades. Today, the neo-conservatives parrot the same reasons: The constitution is: a foreign imposed document; an infringement of Japanese sovereignty; a manifestation of victor’s justice; a blatant violation of the Japanese people’s right to self-defense; an obstacle to the rightful status of the Japanese military. Thus, allowing the Japanese people a right to choose (through a referendum) as times and circumstances change is important and a valid point that needs to be considered. However, the key lies in understanding what ordinary Japanese people want for themselves. The popularity and longevity of Prime Minister Shinzo Abe do not lie in his normalization or rejuvenation of Japan i.e. his foreign policy agenda alone. Most of the Japanese electorate just believe that Prime Minister Abe will be able to help maintain stability needed for economic growth. While many Japanese are convinced by some of the neo-conservative arguments, there is no indication that they do agree with Abe’s proposed solution entirely. There is dissent toward a military rearmament agenda, however, and certainly there is a sizable opposition to constitutional amendment. There are many questioning whether Abe’s agenda is indeed the best way forward for Japan, and no amount of official narratives and media messages would change that easily. A certain segment of the Japanese public remains relatively suspicious of the Japanese government’s attempt to remilitarize Japan unconditionally and without restraint. Thus, even though the Abe administration has so valiantly tried, they have had limited support. The postwar generation, infused with the spirit of pacifism, is thoroughly conflict adverse. This pacifism is not only manifested in Japanese institutions such as the liberal democratic structures that have been put in place, but also lives on among the people as both a culture and a tradition. Many of those at the forefront of the protests against the security bills, in Okinawa and even in Tokyo, are of the younger student generation. Even though they might not like China, there is every reasonable expectation that they also might not like what the neo-conservatives are proposing. One should not automatically assume that just because there are popular negative perceptions of China in Japan, one would necessary agree with Constitutional revisionism. From the perspective of the US, constitutional revision has been something that successive US administrations have asked for as soon as the Japanese constitution was imposed on Japan by Truman and MacArthur during the Occupation period. The main motivation behind this was that the US needed an ally in Asia to fight its Cold War and to prevent the spread of communism. Particularly with the onset of the Korean War, this emerged as an issue of critical strategic importance, not only of political expediency. The best anti-communist leaders, the US learned, were ironically the right-leaning politicians of the pre-war and wartime cabinet. Rehabilitating such personnel and putting them in place in the new system that had been set up ensured both loyalty (to the anti-communist cause at least) and competence in leading the nation. McArthur’s aims of both containing and punishing wartime criminals had all but dissipated by the 1950s. Many of the rehabilitated wartime elites who adopted pacifism as their political philosophy and outlook became founders of reputable firms and institutions in Japan. However, there are others with revisionist views of the war who have also risen to positions of powers and influence—and the views of these politicians sit uncomfortably with those who fought in the Pacific War. It is in the interest of the US to cultivate a Japan that is entirely devoted to its strategic goals—a Japan that tries to align its goals to the US, but when this is not possible, subordinates Japan’s national interests while maintaining the narrative of alliance unity. During the tenure of Prime Minister Koizumi, US-Japan relations blossomed, driven largely by Japan’s unwavering support for the US War on Terror, and Prime Minister Koizumi’s friendship with President George W. Bush. The deterioration of Sino-Japanese relations during this period was often blamed on the US War on Terror, and for its neglect in maintaining its relations with Japan and China to keep a balance. Yet, in retrospect, this could alternatively be seen as the period that was most successful for US policy in the region. The neglect caused the Japanese to struggle and come to terms with the prospect of dealing with China on their own, and the anti-Japanese riots have reaffirmed the Japanese conviction that their alliance must be tightened, even though they seek normalization in their foreign and security affairs. At the same time, China learned through the Koizumi era (and the subsequent DPJ era, especially from the Senkaku Islands dispute), that the Japan that China is dealing with is a radically different Japan from yesteryear. Even though the Chinese believed for years that it was the security alliance with the US that prevented Japan from reaching out and building closer relations with China, this assumption began to look questionable, particularly from the Koizumi year onwards. Without the assistance of the US, China does not quite know what it could do to handle its relations with Japan. In a nutshell, even though the US neglected to pay more attention to Asia during the War on Terror years, its policy had inadvertently driven both China and Japan to seek closer relations with the US in their bid to hedge against each other. The US, however, did not find Japan unproblematic. Washington D. C. became truly vexed, with relations with Japan under the tenure of the first DPJ prime minister stalled. Keen to “rebalance” Japan’s foreign relations, Prime Minister Yukio Hatoyama’s alarming (perceived or real) tilt toward China and Korea did not go down well with neo-conservatives in Japan or Washington. The reaction in Hatoyama’s Japan was telling. The speed by which public opinion turned against Hatoyama was an indication that his election was premised upon what the LDP was not doing right rather than upon his professed agenda of recalibrating Japan’s foreign relations with the US and its neighbors. Even China found the DPJ’s tenure frustrating, as it became apparent that the DPJ did not have a handle on the domestic politics situation in Japan, and even Beijing found it difficult to decide locate someone who can speak for Japan at the height of the Senkaku crisis. From Beijing’s perspective, it was easier to deal with a nationalistic LDP than a friendly DPJ who was not able to rein in the factions, bureaucracy, the military, the political opposition and press. Beyond that, the United States’ ability to handle Japan suddenly found a new appreciation in Beijing. This new-found confidence in the LDP certainly did wonders for the incoming Abe administration. For Beijing, it was a relief that the period of anti-Chinese sentiments seemed to be handled nicely by this administration, whose hawkish position on these issues appeared to rein in excessive nationalistic calls. The US was relieved that this sense of Hatoyaman adventurism had subsided by the time Prime Minister Noda came to power. The last DPJ prime minister went further than his predecessors in his “nationalization” of the Senkaku Islands, and in the reaffirmation of the US-Japan Security alliance. Noda even reversed Hatoyama’s positions on the Okinawa Islands, and went ahead to put in place several policies that were more traditionally LDP (or Japanese) in nature. Both the US and China heaved a sigh of relief when Japanese politics returned to “normality” with the election of Abe. The election of Prime Minister Abe for the second time was well received in Washington. What could be better for the US than for the scion of Prime Minister Kishi, (who single handedly pushed through the revised US-Japan security treaty bill through the Diet in the 1960s) be appointed Prime Minister after the tempestuous DPJ era. The Japan of the Abe 2.0 era was certainly more decisive and forward looking than under his predecessors. Even though various US scholars and commentators question the effectiveness of Japan as an alliance partner under Koizumi, their wishes for a Japan to be led by a leader with staying power came through. As far as the US was concerned, an end to the revolving door prime ministers that had so come to characterize the post Cold War era were certainly a dream come true. The Abe administration exhibited a kind of attitude that is reminiscent of China’s “leaning one side” (with no question of ambivalence) at all toward the US, but this is not surprising at all. Prime Minister Abe campaigned vigorously for a revival of the US-Japan Alliance, publishing his manifesto through his book, (A Beautiful Japan) which was never translated into English for wider circulation as planned. The question is whether the US could count on the neo-conservatives to support this strategy, after the Cold War. There is no question that this is entirely possible—but it begs the question whether there is merit to the neo-conservative’s often-articulated strategy to tighten the alliance in order to obtain more latitude and independence from the US. Such articulation, however, opens up the debate as to the real intent of the neo-conservative politicians: is closer collaboration with the US an instrumental strategy by which more latitude for Japan is sought, and if so, would a strategically more independent make Japan remain beholden to US policy goals in the future? From China’s perspective, Japan’s constitution serves as a political and legal latch on Japan. How “useful” this latch is in time to come remains to be seen. Given the incremental legal and administrative approaches the post-Cold War Japanese governments have taken to bypass constitutional constraints in terms of advancing the military deployments or revamping the JSDF to support US operations, the constitution remains more effective in spirit than perhaps in practice. Today, the Chinese know that the Japanese military possess the most formidable military hardware in Asia, and have the technological might to dominate the most important fields with military applications. The problem, however, is not so much with the fact that Japan wants to revise its constitution, so that its appeal and operations are commensurate with the new strategic realities surrounding Japan. China’s concern is the perceived historical whitewashing and the general historical narratives that have been constructed by the conservatives with regards to history and how this narrative stokes wholesale anti-Chinese nationalism at home and abroad. This certainly begets enmity among the young people in Japan toward the Chinese government and the Chinese nation. Ironically, this is exactly what the neo-conservatives in Japan are accusing the Chinese government of—the instrumental usage of history and nationalism to stoke anti-Japanese sentiment. More worryingly, China has always viewed the handling of Japanese issues in its foreign policy as a subset of its relations with the US. This is a logical extension of the Cold War practices, a by-product if you will of the Yoshida Doctrine. Yet, the end of the Cold War did not bring about the improvement in Sino-Japanese relations that many Chinese commentators had hoped for. Japan-China relations deteriorated over a series of issues—some involving the US and some not. It became increasingly clear that Japan needs to be dealt with in its own right, particularly with the LDP (whom many Chinese consider as China’s old friends). From 2000 onwards, from the election of Junichiro Koizumi to the present, Chinese leaders have been shocked to discover a new breed of LDP conservatives in power—unlike their older colleagues in the LDP such as Yoshida, Tanaka or Nakasone—whose ideology seems to be centered on all things anti-Chinese. The key here is that Koizumi had detached Japan’s treatment of history from being a factor in the state of Sino-Japanese relations—and this is a fact that has not sunk in with the Chinese. The assessment of Japan’s strategic proclivities had also started to change in Chinese discourse. From Beijing’s perspective, the qualitative change in the way China was presented in Japanese narratives was alarming. In 1998, when North Korea fired the first missile that overflew Japan, North Korea was constituted as the primary threat in Japanese strategic narratives. While the defense community in Japan continued to fixate on North Korea, the place of China moved from expressions of “concern” to outright security “threat” by the early 2000s. The difficulty China had with Japan was in understanding Japan’s psyche, as their understanding of being able to “handle” Japan through managing relations with the US were completely negated by the time Koizumi stepped down as prime minister. To that extent, elites debating in Beijing had a hard time understanding what it was about China and its rise that Japan feared so much. Even though common Chinese people are gleeful at the prospect of “catching” up with the US and Japan, most Chinese elites are sanguine about the real situation, as China is still decades away from truly catching up with Japanese or American hard and soft power (Van Ness 2001; Farley 2018). This view optimistically assumes Chinese growth rates remain constantly high or that Japan and the US continue growing at their current rates. Thus, China perceives with some anxiety the “normalization” of Japan, and assesses that Chinese elites have taken a decisive position not to in anyway show signs of friendliness and good neighborliness to Japan. Senior Chinese scholars and policy elites have interpreted Japan’s attempt at constitutional revisionism with a suspicious and a somewhat ambivalent manner. They are not sure whether China prefers a Japan that is more independent strategically to a Japan that is assertive under the general US-Japan alliance (as it is now). They would certainly prefer a “friendly” Japan, but there is no agreement what this actually means to the Chinese elites. One fundamental standard is the way perhaps is to see how history, particularly the war with China, is being explained to the younger generation. Chinese commentators have indicated that while Japanese leaders certainly have the right to cultivate patriotism among the young, inculcating historical revisionism over issues such as the Nanjing Massacre or comfort women certainly does not help matters. It cultivates anti-Chinese sentiments and inculcates an entire generation of young Japanese with a misguided sense of history. There are of course counter-allegations from Japan on the similar state practices over history (over events such as the Great Leap Forward, the Cultural Revolution or the Tiananmen Square Massacre) or the Chinese propensity to use “victimhood” (in the words of so many scholars) to gain the diplomatic upper hand. However, these narratives miss the point: China, Korea and many other parts of Asia did suffer from Japanese imperialism—and raising these allegations about the post-1949 communist government in China does not negate the unfortunate period of history in pre-1949 China. Memories are a lot more tangible and consequential than people assume them to be. These generational memories are not derived from thin air. They come from the memories inherited and passed down by the previous generations. These memories are mediated and transformed through various media—museums, performing arts, stories, literature and oral history. Some memories are actively manipulated, while others are pristinely preserved. What is true is that as society changes, these memories morph and transform with generations—perhaps through new ways of interpretation. Generational memories interact in a strange way with national identity. The latter guides what memories are to be retained and given a prominent place, and what memories to discard or delegate to the deep recess of social remembrance, and in turn, social memories help heed and evolve national identities. National governments might have short memories because of the exigencies of the moment, but nations have long ones. The debate over the content of certain events such as the Nanjing Massacre or the atomic bombing of Hiroshima and Nagasaki in social memories in China and Japan are well known and need not be rehashed here. What needs to be highlighted is this: while attempting to cultivate the “correct” political orientation toward history, societies often choose to repress certain memories. These memories while being repressed might still figure prominently in a people’s identity—memories repressed by state or nation might not be discussed in public but the likelihood is that they will not be forgotten because of their poignancy to social history and conscience, but also, because they are essential for nation-building and identity forging. The problem as it happens is that the memories of the unpleasant interactions over the last 30 years have morphed into layers and layers of social memories that have prevented the Chinese and Japanese nations, particularly the younger generation, from having a shared sense of history and a common narrative. China therefore views Japan’s attempt to revise the constitution and eradicate pacifism as parts of an attempt to eradicate an understanding of the Pacific War and the aftermath reached by the interpretation of the previous generation. This revision means that younger Japanese people do not get told clearly why the Second World War was fought, and why Japan should bear the majority of the responsibility. If the revisionist interpretation offered by Prime Minister Abe has become the bedrock of modern Japan, and informs the subsequent state policy, it is only natural that China, as much as the Koreans, takes issue with Japanese policies. Abe’s efforts to revise the constitution, to have closer relations with the US and reform the status of the JSDF, have encouraged Japan to play a global role that has become suspect and inappropriate in Chinese eyes. Simply put, China complains that the revival of Japanese militarism does not come out of nowhere—it is linked to Abe’s and the general right wing’s revisionist projects that are going on in Japan. Therefore, to say that the Chinese are using the “history card” might not actually be quite on the mark, as the effectiveness of the “history card” is not entirely clear either, and in reality it might backfire on the Chinese government more than it affects the Japanese government. Most importantly, since the Koizumi administration, the Japanese government has made it abundantly clear that their China policy is not one that will be affected by what the Chinese (or the Koreans) say about history. The resistance against Abe is ironically echoed by some segments in Japanese society who have reacted to the Abe administration policies positively over the past few years. Abe’s normalization and rejuvenation agenda is increasingly facing resistance from various segments of society, even though the prime minister has skillfully capitalized on the recent geopolitical developments—particularly the rise of China and the belligerence of North Korea—to make the case for Japan to remilitarize, undertake collective security responsibility and increase its global and military role, particularly through the deployment of the JSDF. If anything, the Prime Minister has also skillfully manipulated and propelled Japan onto the path of becoming a global power—continuing the good work done by successive generations of Japanese leaders since pre-modern times. However, there is resistance to the prime minister’s plans, making his mobilization efforts difficult to sustain. This is particularly so because the strategies that Japan has undertaken over the decades to address its security challenges seem to have worked (such as incremental secondary legislations and administrative workarounds), and also because tensions in Sino-Japanese relations often ebb and flow over time, even if the narratives over the China threat are sustained. The younger students that show up to protest against Abe, however, do not necessarily share the concerns of the Koreans and the Chinese over historical revisionism and revived militarism. The constituent makeup of these groups of protestors is diverse—ranging from elderly Japanese from the wartime generation who have participated in the Second World War, to pacifist housewives and civic activists who are suspicious of the LDP and young people. The younger generation has often expressed the idea of apologies fatigue, but often is receptive of the security challenges that China and North Korea pose. The problem, however, is that many of the younger protestors do not see these as important enough reasons for Abe’s erosion of Japan’s unique postwar cultural traditions and practices. These protests argue that the LDP under Abe is acting above the law and subverting the democratic process. Others object to the militarization by arguing that the JSDF are nothing but tax thieves. Some are concerned by the possibility of being drafted to fight for Abe’s wars. Viewed from China’s and Korea’s perspective, the fact that not too many are standing up to the historical revisionism that underpins the militarism advocated by the prime minister and his supporters is worrying. Many of the younger Japanese who do protest (against the Japanese government) might ironically agree with the right wing’s view that the Nanjing Massacre never happened, or that comfort women were “prostitutes” or that the judgment by the International Tribune for the Far East is a “victor’s justice.” They protest against Abe and the neo-Conservatives because they feel principally that they have not been consulted or that the policies were undertaken in an undemocratic manner. This does not necessarily mean they are sympathetic to the Chinese or Korean concerns. It is not just about the rearming, but really also about the intent behind this, and the misguided notion of “blaming” the victim, that concerns the Chinese and Koreans—something that is seemingly ignored or overlooked, even by those who are resisting the prime minister’s efforts. The rejuvenation of Japan, and the three important pillars of reforms are, in the view of the Abe administration, necessary to securing Japan’s future. Taking a step back—the question is, securing Japan against what? There are domestic and foreign criticisms against current Japanese strategy beyond those of the pacifists. Japan’s foreign policy has been criticized for being overtly reliant on the US; premised on an erroneous historical revisionist narrative that undermines Japan’s pacifist image and democratic values; and self-fulfilling in its China threat sentiments. Where does that leave Japan? The rejuvenation of Japan is an important exercise, and sufficient time has passed since the end of the Cold War for Tokyo to have understood the challenges and difficulties for its normalization as a nation-state and its rejuvenation as a global power to achieve a status commensurate with its strategic aspiration and ambition. Even though there have been clear and articulate voices, such as that of Yoshihide Soeya, who has argued since the mid-2000s that Japan should adopt a “middle power” strategy. This “middle power” strategy is born out of a neo-realist appreciation that Japan would likely eschew any ambition to contend with the US and China in terms of power capabilities. Soeya perceives such strategic competition to be self-defeating. It is therefore unlikely that Japan would change its position on the constitution and the US-Japan security alliance, and should strive to close the gap between its economic prowess and military capabilities. Japan’s natural partners lie with South Korea, Australia and ASEAN, since they situate themselves with the US on one hand and China on the other, and allying with these powers would give Japan more flexibility in the region’s diplomacy. This approach is typically Japanese: virtuous, strong and displays the utmost humility, and this is the kind of thinking that generates the most respect for Japan when viewed from the outside. Yet, on the face of it, the neo-conservatives of the LDP have not taken this recommendation wholly on board. Under the Abe administration, Japan has embarked on embracing the US in a whole-hearted manner—with an increasingly strident anti-China tone, that has grown louder and shriller since the mid-1990s. China has given many reasons for the LDP to capitalize on the “China threat” theory, from increasingly assertive postures (in reality insecure and defensive reactions in most cases), to non-compromising rhetoric, to opaque military budgets. However, the question before Japan is this: in enacting this policy of leaning one side toward the US unquestioningly, and backing the US unconditionally, would such an allegiance benefit Japan in its quest to achieve the security and the global power status that is commensurate with its economic status around the world? A cursory survey of Japanese foreign relations in East Asia would provide a clue to this. In Northeast Asia, Japan can count on Taiwan to be usually positively predisposed to it, particularly after Ma Ying-jeou stepped down as president of the Republic of China. Japan’s relations with South Korea, a US ally, can hardly be described as good, even though they have both appeared to stand side by side with the US on many matters, such as Terminal High Altitude Area Defense (THAAD) deployment and North Korea in particular. However, Japan’s relations with South Korea are still dogged by the territorial dispute over Dokdo/Takeshima; historical burdens concerning the Second World War, particularly over the comfort women issue; and Japanese colonization of Korea. Japan-China relations have been at a low point, with the Chinese and Japanese leaders having little high-level contact for the past seven years, until the 2018 official visit by Abe to Beijing to celebrate the fortieth anniversary of the Treaty of Peace and Friendship. Japan’s relations with North Korea are probably the worst among all its East Asian neighbors. North Korea has kidnapped Japanese nationals, fired missiles over Japanese territories and most likely would target Tokyo for military strikes in the event that US relations with North Korea deteriorate substantially. In other words, in the two decades following the end of the Cold War, Japan’s security environment has deteriorated to a large extent despite the LDP’s policies of “handling” these challenges through the tightening of the US-Japan security alliance. How could Japan possibly enhance its security in East Asia? A possible way would be for Japan to recalibrate its role in the US-Japan alliance. Rather than leaning unconditionally toward the US, Japan might consider that a critical aspect of normalizing/rejuvenating would be to posit a certain measure of independence from the US if it is in Japan’s interests. Unconditionally subordinating Japanese interests in the name of alliance unity erodes Japanese sovereign dignity politically, undercuts Japanese diplomatic initiatives and undermines Japanese democracy at home. Putting Japanese interests first is critically important as a hallmark of Japanese normalization and rejuvenation. It would be fallacious to assume what is in the national interests of the US would always be in the national interests of Japan. Likewise, it would be foolish to assume that what has worked in the past will always work in the future. First, the logic is simple, becoming more independent strategically might increase the value and attractiveness of Japan’s cooperation in the alliance rather than decrease it. Unthinking subordination in the name of “holding the alliance partner closer to achieve more independence” defeats the point of the “alliance” in the first place—of advancing Japanese national interests and security in the long run. As the hegemonic struggle between China and the US is projected to increase over the years, the dangers of entrapment by the alliance into a conflict with China is every bit a possibility. There is no guarantee in terms of continuity of policies with the US—as Prime Minister Abe learned when the Trump administration scrapped the TPP and agreed to a summit with the North Korean leader Kim Jong-un. Japan could and should learn how to say no (again) to the US when it is not in its interests to say yes, and should not be worried about diverging from the US position if needs be. It may be far from obvious to the LDP elites, but Tokyo’s fear of “abandonment” is misguided. The alliance is just as important to the US as it is to Japan, and it is difficult to see how the US would “abandon” Japan, just because Japan speaks its mind. Tokyo brings concrete benefits to the table in the alliance, and should not be afraid to assert its rights. After all, the US is clearly no longer the hegemon in the Asia-Pacific (Ikenberry 2014; Chellaney 2018). Second, it demonstrates a Japan that is actually capable of exhibiting a normality in its foreign relations instead of being voluntarily entrapped in an alliance in service of another nation’s goal, even when it is against its interest to do so. This is not the equivalent of calling off the alliance or behaving difficultly with Japan’s long-time alliance partner. This is also certainly not suggested with “Chinese interests” in mind. The basis of normalization and rejuvenation presupposes Japan acquires greater autonomy, not less as a result. Years of subordination to the US position has conditioned Japanese diplomats and politicians to respond with a defensive and knee-jerk reaction to any suggestions that Japan should adopt a more independent stance (from the US politically and militarily) by dismissing such suggestions as “Chinese propaganda”. There is a difference here: becoming more independent from the US does not mean that Japan should naturally become more pro-Chinese. This kind of thinking constricts the Japanese diplomatic position in a “black or white” binary way. It just means that Japan should privilege its interests above affinity with, or alliance against, any other nation. At the same time, Japan should be mindful that the abandonment might come even if Tokyo adopts a “leaning to one side” posture if cooperation with China results in significantly greater benefits for the US, if the US assumes they have the Japanese position locked down under any circumstances. Third, the “invisible” price of membership of this alliance might be significant, particularly in terms of opportunity costs, both in Asia and beyond. Japan’s choices are not binary in nature but could be more varied and nuanced than imagined. Japanese foreign policy elites might think they are piggy-backing on a US global presence to globalize Japanese foreign policy, but the fact remains that such a strategy might hinder rather than help Japanese ambitions. Beyond tangible material benefits, these costs also manifest themselves in potential relations with foreign states where Japan might have an interest in cultivating security and diplomatic breakthroughs. Historical evidence has shown that Japan’s interests have always been subordinated to the US position, either by design (Japan voluntarily subsuming its interests and aligning its position with the US) or by compulsion through negotiations (as in the case of Iran, for example). In certain areas where Japan has interests that diverge from US interests, it is likely that Japan would have to give up its interests, particularly where the US interests are considerable. Once that happens, then it does not matter what the Japanese have done or are doing, US interests will no doubt come first. The recent developments (2017–2018) in US relations with North Korea certainly showed that Japan would be forced to accept a US position rather than reject it. Prime Minister Abe’s multiple visits certainly did not help mitigate the situation with North Korea, and in the end, the way the US agreed to the summit was eerily reminiscent of the 1972 rapprochement between the US and China. From US statements, Japan has reportedly shouldered the bulk of the burden sharing. It has borne the cost of every generation of new US weapons and supported most of the US deployments in Asia. Fourth, the persistent over-riding of Okinawa resident’s interests by Tokyo in favor of arrangements for the US military on Okinawa is undemocratic in nature. Given how Prime Minister Abe has articulated again and again Japan’s democratic credentials as a fundamental basis for Japan’s values-based diplomacy, and in reaching out to allies such as India and Australia, this comes across as being a little hypocritical. Why should the democratic rights of the Okinawa people or the young students protesting outside the Diet over the various legislations be ignored, while the neo-conservatives harp on about the fact that Japan is a democracy? Externally, such strain on democracy does not help either if it is only coached in anti-China terms. If Japan were really democratic (since Prime Minister Abe has been fixated on the idea of a values-based diplomacy), then Japan’s relations with Vietnam or Laos should not be as good as they are now, since these countries are still communist. Consequently, the neo-conservatives actually give Japanese democracy a shade of doubt. The democratic narrative becomes every bit as hypocritical whether from the perspective of Okinawa or from the perspective of Southeast Asia. The privileging of the US in Japan’s foreign relations, particularly vis-à-vis China or Korea suggests that Tokyo is not at all worried about the opinions of its neighbors. Yet Japan has always made a case that it would like to speak for Asia, particularly when in its narrative it asserts the rule of law in the region (against China in the South China Sea, for example). The problem is this—if Japan wants to lead (in Asia), then it needs to have not only the support of its neighbors in Southeast Asia, but also in East Asia. Japan’s relations with China and South Korea face a fair amount of difficulties, and currently relations with North Korea are as good as non-existent. Only relations with Taiwan are good, but Taiwan is not a sovereign nation-state. Japan’s diplomacy has more traction in Southeast Asia. Of the 11 states in Southeast Asia, Japan maintains good relations with most if not all of them, cultivated through long decades of meticulous diplomacy, particularly through the implementation of the ODA mandated by the Fukuda Doctrine in the 1970s. Tokyo has undisputedly assumed leadership of the region as its economy recovers from the ashes of the postwar era, leading the growth of East Asia’s and Southeast Asia’s newly industrializing economies (NIEs) of Singapore, Taiwan, South Korea and Hong Kong, and closely behind the ASEAN NIEs. This episode of steady and reinforcing growth was interrupted in the 1990s when Japan’s growth stagnated, and was subsequently sidelined by the rise of China. Despite this, Japan did not retreat strategically from Southeast Asia after the end of the Cold War. Japan stepped in to provide humanitarian assistance, and participated in UN operations in Cambodia and East Timor. Since 2012, Japan has been at the forefront of a multilateral effort to confront China in the South China Sea, backing the Philippines and Vietnam in their claims against the Chinese. Needless to say, this act of supporting the US, Vietnam and the Philippines could be construed as confronting the “bully” in the region, but it also reinforces the realpolitik hegemonic tensions caused by the US in trying to curb a rising China strategically. This might have the unfortunate consequence of forcing the Southeast Asian countries to choose sides. Southeast Asian countries do not wish for the region to become an arena for great power competition, and Japanese (as well as American or Chinese) pressure is not welcome. Unlike most Asian countries, Japan identifies itself as closely associated with the industrialized West. This identification goes back to the Meiji era, and certainly has helped build Japan’s sense of national mission and industrial efforts. The vestiges of Japan’s ambition to join the valued Western colonial club of the last century can still be felt in Japan’s membership of the OECD and G7, where Japan is ostensibly the only Asian country in the developed nations club. Alongside its preference for the US, there is an impression that Japan is first and foremost a Western power as opposed to an Asian one. The operative word here is first and foremost. Japan’s interests are seen to be more tied to US interests. At the same time, most Asians, including a significant percentage of Chinese and Koreans, have an admiration for aspects of Japanese society and culture. The humility, intelligence and diligence of the Japanese people are well known and highly respected throughout Asia, and Japan’s industrial prowess and technical advancement have meant that Asian countries look to Tokyo for leadership in many aspects of economic and industrial development. Japanese cultural developments and consumerism provide the requisite leadership that further fuel Japan’s prestige and soft power. For other Asians, for the most part, daily interactions with Japan and the Japanese people have been largely positive, and the misdeeds of Japan’s imperial past do not automatically cast a shadow on these daily interactions. The election of nationalist politicians—the likes of Shintaro Ishihara, Toru Hashimoto, Junichiro Koizumi and Shinzo Abe—have given the impression that right-wing views are prevalent and popular in Japan. Historical revisionism gets advertised, and it damages Japan’s image in its immediate neighborhood in a big way. Japanese nationalism, particularly when based on misogynistic and radical interpretations of history, does a disservice to Japan’s foreign relations, particularly with China and Korea. Diplomats in China and Japan have often dismissed questions whether history has affected their bilateral relations, citing the paramount importance of national interests in making foreign policy, not wishy-washy influences of the “burden of history.” Sadly, these diplomats and policymakers schooled in thinking about national interests conceived of them in mainly material terms but in reality history issues are identity issues. Revisionist accounts affect the effectiveness of Japan’s diplomacy. They also detract from an inclusive sense of Asian identity that Japan might want to inculcate in the region if it is indeed building some sort of pan-Asian identity. Revisionists suggest that contemporary Japan and modern Asia are prosperous because of the “rightful” acts of those who wage war. Calling events such as the Nanjing Massacre a fabrication, or protesting that comfort women were all prostitutes, or suggesting that the judgments imposed by the International Tribunal for the Far East represent a form of victor’s justice, seems to put the blame on Japan’s neighbors, and undoes decades of goodwill inculcated by Japan’s pacifism and atonement. If Japan is unable to gain the respect and support of its closest neighbors in its backyard, it is bound to have tremendous difficulties achieving the kind of normalization that contemporary leaders in Japan have spoken about—from the likes of Nakasone to Hosakawa to Koizumi to Abe. Historical revisionism unfortunately can only be confronted domestically within Japan by the kind of democratic resilience we have seen, not by the Chinese or Korean commentators. In the short term, it might seem like a good strategy that right-wing politicians such as Abe utilize revisionism in their domestic campaigns and capitalize on the confrontations with China (such as over the Senkaku Islands) to boost the neo-conservative rejuvenation agenda. This could even be construed as a continuation of Japan’s statecraft since pre-modern times to bandwagon with the prevailing hegemon and balance against the rising power. The problem, however, is that this strategy only gets one so far. Underpinning the rejuvenation agenda with revisionist rhetoric only serves to erode Japanese security and undermine Japan’s credentials as a democracy and pacifist credentials in the long run and hurts Japanese security. These are the very sources of Japan’s soft power that it should seek to grow, rather than replace. These two critical aspects have helped Japan become the role model it is already in so many ways to the rest of the world, particularly at a time when the US is undergoing so much change domestically and globally. Unfortunately, this consensual and non-confrontational nature of Japanese culture means that most of the progressives within Japan, particularly well-respected intellectuals and critics who are best poised to challenge and confront revisionist interpretations of history, are uncomfortable doing so loudly and assertively in public. This goes against the grain of Japaneseness, and the interest of preserving civility and maintaining professional opportunities. The opposite is also true—revisionism encourages more bigotry across the political spectrum and truly offends the victims of the Second World War. This actually degrades Japanese security in the long run, because popular opinion in both Japan as well as in the neighboring countries might not support cooperative gestures. For a period of eight years, between 2011 and 2018, there was virtually no high-level contact between China and Japan (notwithstanding the couple of times where President Xi and Japanese leaders attended regional conferences together). Even though there are signs in 2019 that Sino-Japanese ties are warming, the situation is far from ideal. The existing institutions such as the US-Japan alliance can be made stronger without the revisionist narratives and rhetoric. Certainly, the elder generation of American soldiers who fought in the Second World War will disagree with such revisionist rhetoric, as would any right-minded individuals in Japan. Even the neo-conservatives in the US are ambivalent, but most prefer to privilege the alliance over the difficulties in history, given the urgency of containing China or confronting North Korea. However, this does not mitigate the situation, as some are wary that this nationalism could be aimed at the US some day in the future. They are not far wrong—anti-US sentiments have always been present, but the fact remains these sentiments are exceeded in a large way by anti-Chinese and anti-Korean sentiments. Genuine normalization and rejuvenation for Japan should therefore entail a certain recalibration of Japan’s relations with both the US and China. This recalibration would shift the basis of cooperation toward a truer partnership where there is room for Japan to disagree with the US, and for Japan to develop a more rounded and comprehensive partnership with its Asian neighbors independent of the US. Given the trade war and changing economic circumstances in 2018, Japan might do well to rally with China and try to starve off the effects of a US going into deep recession (Rowley 2018). Closer relations between China and Japan would present Japan with the opportunity to live up to its promises of upholding democracy, values and principles as it stakes out a position to be pro-peace as opposed to being just pro-alliance. The author believes that the majority of the Japanese people remain deeply invested in both the spirit and the operationalization of the peace constitution, and perceives this as one of the most important apology statements that Japan as a nation has made and continues to choose to make.Chalmers Johnson, one of the most respected political scientists in recent times, too has stated publicly that it is his belief that the peace constitution is the best apology that Japan could make to her neighbors because it is a conscious choice Japan has made to give up her sovereign war-making right. The chapters within this book have shown that Japan could do well to contribute to important global causes and issues beyond just check-book diplomacy. It has already done so in Southeast Asia (and continues to do so in Southeast Asia and elsewhere). Japan’s choice during the post-Cold War era has been to increase its cooperation with the US, and this choice has been implemented at an accelerated pace, in reaction to the rise of China but ostensibly sold as China’s threat to the Japanese domestic audience. This strategy might well have suited Japan over the course of the last two decades or so, but it actually will not help in the long run for two reasons. The first and the most important is that this kind of rhetoric is self-fulfilling. China-Japan relations were relatively amicable in the early 1990s, and even though there were difficulties in bilateral issues that emerged in the mid-1990s, the relationship only reached a new low during the tenure of Junichiro Koizumi and Abe. Prime Minister Koizumi actually visited the Museum of the War of Chinese People’s Resistance Against Japanese Aggression at Marco Polo Bridge in Beijing when he visited China in October 2001. During this visit, he expressed ‘deep remorse and a heartfelt apology’ (Fukuda 2015), but his repeated visits to the Yasukuni Shrine managed to drive relations to one of the lowest point in history, resulting in the massive anti-Japanese protests in 2005. Prime Minister Abe is even more hawkish and at the same time more systematic in advocating for his normalization agenda. Like Prime Minister Koizumi, Prime Minister Abe has largely similar policies, but unlike Prime Minister Koizumi, Prime Minister Abe’s family background provided him with the nationalist credentials he needed without needing advisors such as Isao Iijima to mold his media image (Strom 2001). The chapters on Japan’s cooperation with China in combating piracy in the Middle East demonstrate that China and Japan can work together on security issues. It also demonstrates that there is actually no barrier to cooperation in wanting to deliver an international public good together, and if both sides have the will to do so. In this case, the initiative to cooperate came at the working level of the task force in a multilateral setting, working alongside other navies. If China and Japan found it difficult to cooperate within East and Southeast Asia in the past, either because of Japan’s normalization agenda or particularly because of its alliance with the US, Japan could now undertake an alternative strategy to help its normalization without taking on an anti-China bias. In seeking a global role, Japan could seek a partnership with China in places where there is resistance to the US. There are numerous places around the globe where China arguably faces less resistance than the US, and an ad hoc partnership not only would enable Japan to show that it can work well with the US in its traditional security agenda, but also forge new partnerships with China worldwide to contribute to causes never previously imagined possible. China has traditional links to the blocs and countries not in the “traditional” alliance bloc of the US—in Latin America, in Africa and Middle East—more so than Japan, for both historical and political reasons. Japan’s cooperation with China in the Gulf of Aden did not come about as a result of an intentional political desire on the part of both Beijing and Tokyo to cooperate. This happy turn of events started out perhaps as a parallel and somewhat competitive effort, but as a result of a multilateral cooperative effort at sea, both Chinese and Japanese task forces did work together. This episode, however, proves that there is no real reason why this cooperation cannot be built on, and that China and Japan can work together on security issues outside of the Asia-Pacific if the time is not ripe to do so within the Asia-Pacific, and also possibly collaborate independently of the US. This is a choice, and is something that Japan has a sovereign right to decide, and it should therefore not be construed as betrayal of the US as such. Japan’s credentials as a pacifist power are unparalleled and Tokyo enjoys soft power which many other nations can only envy. Unfortunately, Tokyo’s humility and fidelity to the US-Japan alliance has prevented it from capitalizing on becoming the global political power it is capable of becoming. In this instance, Japan is suited to be the peacemaker—more so than the US. The recent move by the Trump administration to support Israel unconditionally means that it is more important than ever that an even-handed treatment of Arab and Palestinian causes be advocated. For a substantial time, the view in the Middle East of Japan is that it is firmly entrenched in the US-Japan alliance, and would follow the US assiduously without questions. Now more than ever, Japan would be able to make a difference, and Japan should be able to use its expertise and clout in the Middle East to mediate in the conflicts between Israel and the Arab world, particularly with the Palestinians. Japan has always been active in peacekeeping operations, joining UN blue helmets in the Southeast Asian countries of Cambodia (1992) and East Timor (2002), Rwanda (1994), Golan Heights (2002), Iraq (2004), Congo (2004), Haiti (2012) Sudan and Southern Sudan (2011). Even though these UN missions (as well as those in support of the US, such as the anti-piracy missions) do raise the role of the JSDF, Japan’s focus cannot be on peacekeeping alone. Granted, such activities help provide more opportunities for a Japanese peacekeeping presence. There is no reason why Japan cannot expand beyond these peacekeeping operations to assume a greater political role in peacebuilding and conflict prevention. Consequently, it might be in Japan’s interest to take a more independent posture vis-à-vis the US. Japan has a sovereign right to decide what kind of great power that it wants to become. This should be the decision of the Japanese nation alone. The wisdom of the postwar generation in choosing pacifism and democracy has helped Japan extend its soft power further than possibly imagined, and endeared it with its neighbors. Unfortunately, Asian countries have not appreciated enough that Japan’s renunciation of its war-making power through Article 9 is a sovereign choice that represents the deepest embodiment of an apology a nation can make. Today’s neo-conservatives are advocating the revision of the constitution, and at a symbolic level, Japanese leaders are revoking the apology that Japan made decades ago in the name of national security. The changing conceptualization of “peace” can be worrying—as wars were almost always justified in the name of defense and peace rather than ambition, greed or pride. Be that as it may, the struggle within Japan today reflects the democratic resilience of Japanese society—an indication of how far the Japanese nation has traveled since 1945 and how contemporary Japanese foreign policy cannot be separated from influences of traditional Japanese thinking, philosophy and politics. As Satoh notes, democratic participation is truly replacing quiescent citizen obedience, and the desire to be a responsible member of the international community is [resisting ] an assertive nationalism so that perhaps since the first time since Meiji Restoration, a new national path beckons (Satoh 2010: 586). As Japan continues down its path of rejuvenation and normalization, it will come under increasing pressure externally from countries such as the US and China, and internally from the often divisive forces at home. Japan’s democratic resilience in all likelihood will win through in the end. As Tadokoro (2011: 38–71) notes, [Japan’s] quest for traditional great power status compared to that of the US or China is an untenable goal, even if it were possible, as postwar Japan’s value orientation would suggest an inclination toward multilateralism and international rule of law, not the attainment of economic or strategic supremacy. Japan in short is now at a political crossroads, and the extent of the political support that the neo-conservatives receive will determine the future of Japanese diplomacy. If Japan is able to further work on intraregional integration with Southeast Asia, increase cooperation with China to provide for international public goods and work for joint development in third countries, and moderate the excesses of the US by becoming a true and equal partner in the US-Japan alliance, one can be assured that Japan’s rejuvenation as a global power is not too far away.